Starting your day with this easy, simple and nutritious recipe will help you power through the day. Oats or Porridge as I call it, are by definition a whole grain with a mild creamy texture. Oats can be prepared in a variety of methods like cookies, pancakes, cereal bars and breads. Mixing and matching healthy combinations can inject bursts of flavour to a monotonous bowl of oats. For this recipe I added pomegranate, flaxseed, peanut butter, toasted coconut chips, and vanilla whey protein. Peanuts, although classed as nuts are from the legume family like beans and peas “Leguminosae Family”. A brand that I eat is meridian peanut butter. Great taste and they have no added ingredients like sugar, salt and palm oil. Peanuts are a good source of antioxidants (Grotto, 2011). Lastly , I added vanilla whey protein isolate (WPI) to the mix. WPI contains high levels of protein with little fat or lactose. It is also a good source of branched chain amino acids (BCAA). BCAA are labelled as the building blocks for muscle repair and development (Grotto, 2011). 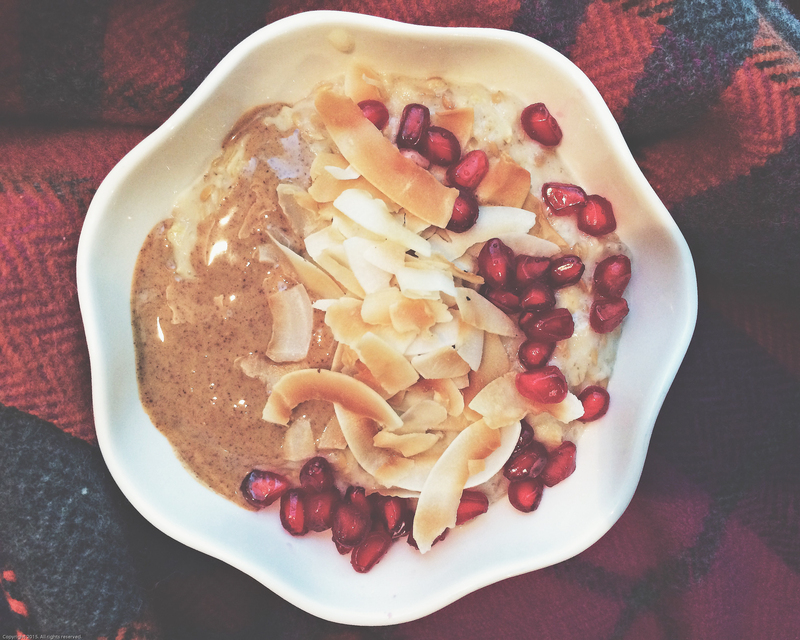 This delicious bowl of porridge would be great before or after a gym session too. Pop all ingredients in a small saucepan and cover with milk. Cook on low-medium heat , don’t allow it to stick to the bottom of the saucepan. Stir regularly.